Nestled next to the mountains, Golden prides itself in featuring stunning natural beauty both within the city limits, and in the mountains and hills surrounding the town. The presence and accessibility of open space surrounding Golden is one of the most attractive features of the community. Open space areas and corridors protect natural values and provide opportunities for trail and habitat connections. 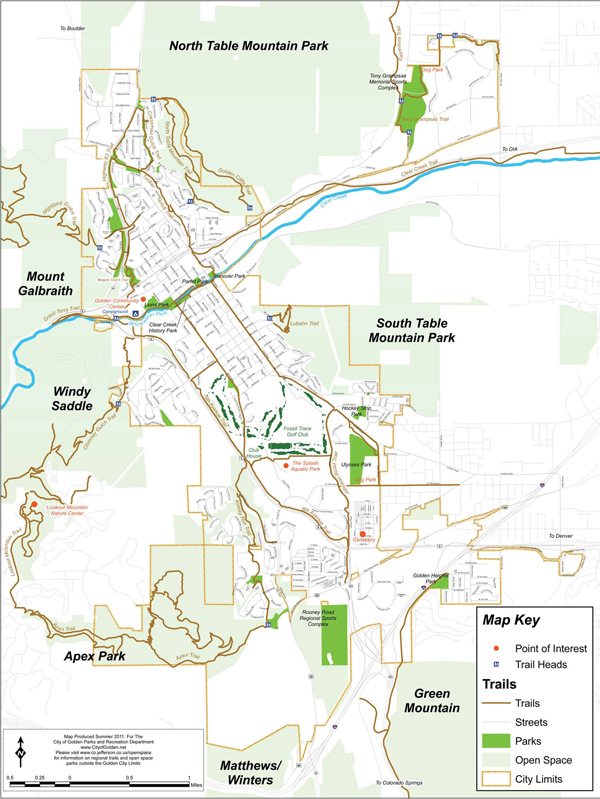 The City of Golden owns and maintains 402 acres of open space, as well as an interconnected trail system of 24 miles, providing diversity in both types of trail experience and destinations. 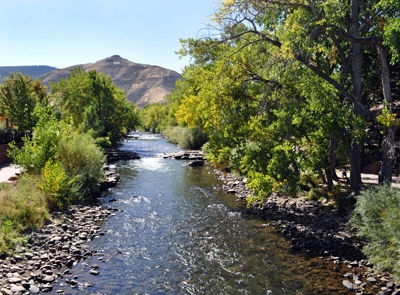 In addition, Golden residents are fortunate to be surrounded by nearly 8,000 acres of regional open space. Please respect private property when visiting open space areas. The City of Golden Parks Division is responsible for all parks, trails, and open space maintenance within Golden City limits. Maintenance duties include playground maintenance, graffiti removal, restroom maintenance, trash, and snow removal. We appreciate resident and visitor communication and feedback to ensure the Golden parks system remains safe and clean. To report maintenance concerns or damages, contact the Parks Department at (303) 384-8140. To provide opportunities for nature-oriented outdoor recreation. To protect large areas containing natural resource values of community-wide significance including wetlands, wildlife habitats, and scenic areas. To safeguard land for its contribution to quality of life and the value of the homes of nearby residents. To limit urban noise, congestion, and encroachment. Bikes must yield the right-of-way to other trail users. Clean up any trash and recyclables, and place in designated bins. Alcoholic beverages are prohibited, per city ordinance (except with a park Open Container Permit, which must be issued 48 hours in advance).